When it comes to luxury beauty brands, there’s one place I never fail to return to get my high-end fix: Rustan’s. The upscale department store here in Makati is one I’ve been frequenting ever since I was a little kid. No joke! I can still vividly remember buying Barbie dolls in the children’s section upstairs, haha. So it shouldn’t come as a surprise that whenever I receive an invite to attend a Rustan’s event, I immediately try to clear up my schedule for that day. Yes, I get that excited! 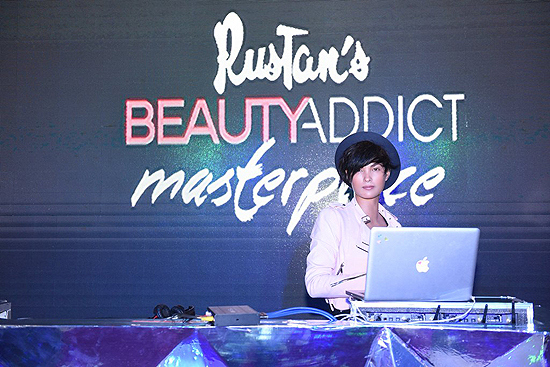 The latest event, held just last month, was entitled Rustan’s Beauty Addict Masterpiece and was simply a celebration of…well, all things beauty! 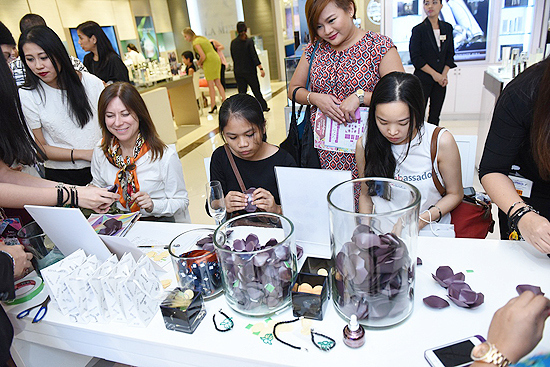 Nearly every brand part of the Rustan’s beauty department, from Clarins, to Chanel, to NARS, had fun activities planned and awesome giveaways and samples for all the guests. Everything was for a good cause too because every written message on the "Signed With Love" freedom wall at the event meant Rustan’s would make a PHP300 pledge to I Can Serve, a local foundation of breast cancer survivors promoting early detection. The ‘centerpiece’ of the event was the beautiful lounge set up where guests could sit back, sip on drinks provided by Belvedere, and chill while listening to the beats being dished out by DJ BadKiss. Did you know L’Occitane sells sweets now? Oh, if only! For the night at least, they whipped up actual flower-shaped cotton candy on demand and had delicious iced cookies up for grabs! If you were feeling up to it, how about a professionally done, mini-photoshoot with complimentary makeovers from Benefit and Estēe Lauder, as well as brow touch-ups at Bobbi Brown? You could also opt to have a more intimate and fun polaroid taking session with friends at the Carolina Herrera VIP Rosé ‘runway’, complete with props! 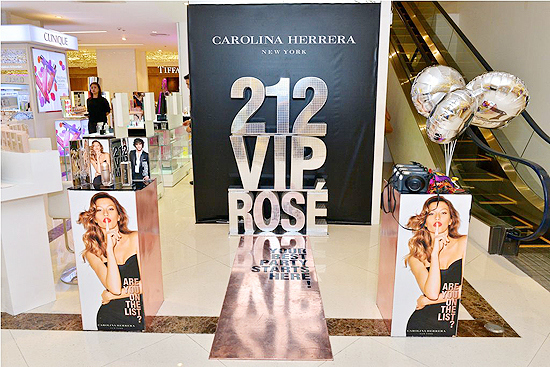 Over at Sisley, guests were making their own artificial black roses that promoted the Sisley Black Rose skin care line. Here Maggie Wilson-Consunji, Mika Martinez, and Bubbles Paraiso are showing off the ones they made. In need of some proper pampering? Skin care brand to the stars La Mer was giving luscious hand and arm massages too. Chanel, on the other hand, had something interesting (and delicious) to offer. Chocolate! 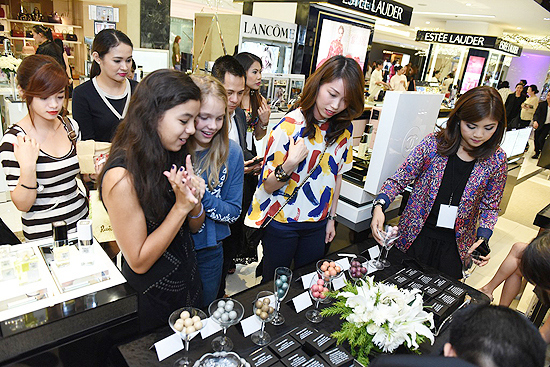 Guests eagerly lined up to pick four flavors of their choice which were designed and arranged to look like one of their gorgeous, pearl-shaped eyeshadow quads. Actress Ruffa Gutierrez looks especially happy with her sweet choices. I posted what I got myself on my IG here! The ‘Signed With Love’ freedom wall. Like I mentioned earlier, each message written meant Rustans would be donating PHP300 to the I Can Serve foundation. 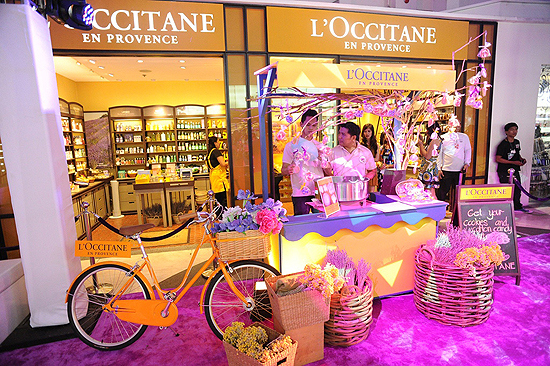 In a uniquely Rustan’s twist, all messages were written using lipstick! Actress and model Phoemela Baranda leaves her own message of support and encouragement too. 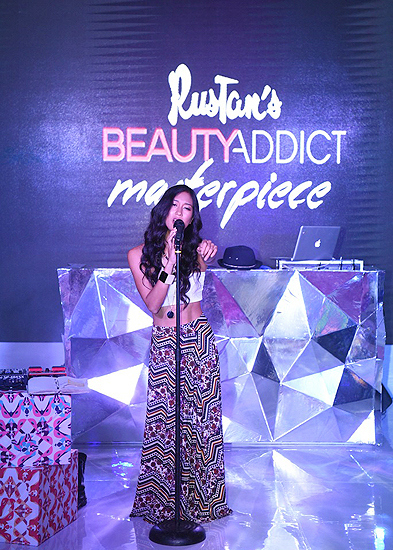 Sultry singer June Marieezy was at the event to soothe and woo the crowd with some of her songs. Aren’t you totally jealous of her petite frame? I am! 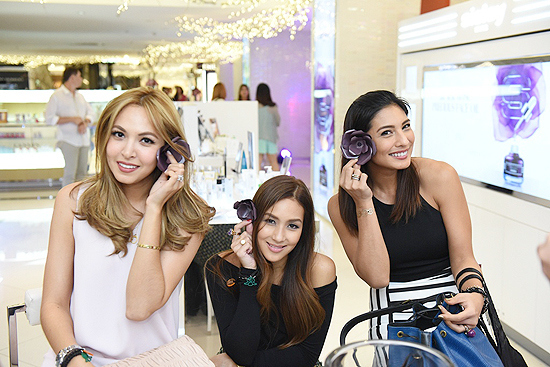 The always stylish Happy Skin co-founder Rissa Mananquil-Trillo was there too. 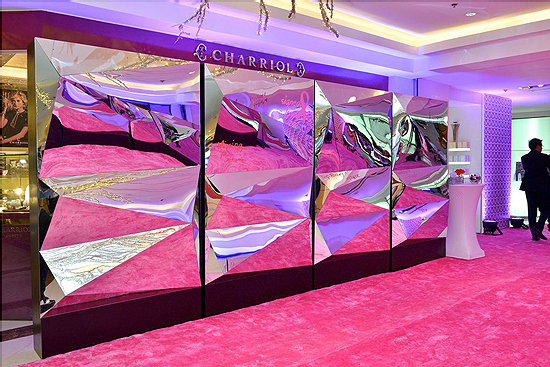 The popular brand recently celebrated its first birthday. There was more fun to be had that night as guests not only took part in activities for the thrill, but to win beauty samples too! 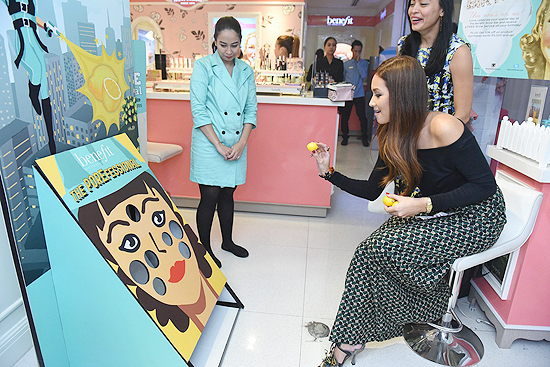 Mika Martinez tries her hand at the Benefit POREfessional tossing game while TV host and actress Iya Villania concentrates on the Bath And Body Works Jenga puzzle. Of course I’m not just here to tell you all about what happened at the event, but I bring great news too! 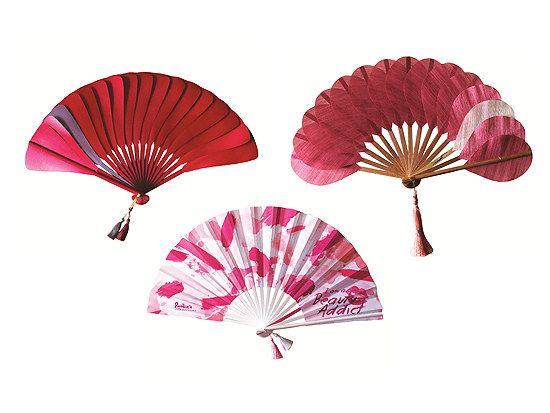 For every single receipt purchase worth PHP10,000 at Rustan’s, courtesy of Casa Mercedes, customers will be gifted with the Beauty Addict Fan – a "13-inch Bayanihan Classic fan emblazoned with a unique pink and white paint stroke design and ‘I am a Beauty Addict’ slogan and finished with matching silk tassels." If you rack up a PHP20,000 single receipt purchase, you’ll get an exclusive, specially designed Fishtail Fan "done in blood satin and accented with a titanium, grey leaf." For PHP30,000 single receipt purchases, you’ll take home an exclusive, limited edition Abanico De Hojas Fan made from "hand loomed Abaca dyed in Sangria, accented with a beige leaf and a unique hoop set in rhodium plated silver, with a ruby colored crystal to enhance the holiday design." The Casa Mercedes promotion is valid at all Rustan’s department stores until January 15, 2015. 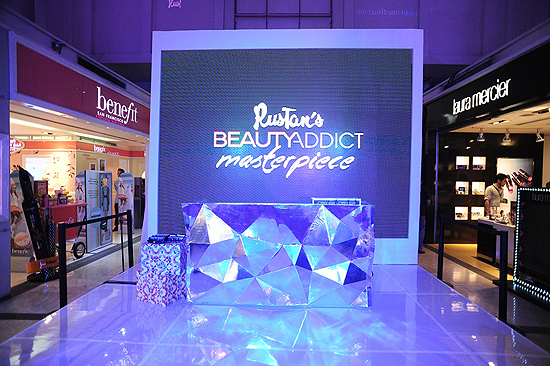 Last but certainly not least, the event also launched the Rustan’s Beauty Addict card! This baby will undoubtedly delight beauty junkies like myself because with it you’ll not only get exclusive discounts, but even complimentary products and spa services! Cardholders are also entitled to one entry for this season’s raffle for every purchase amounting PHP1,000. Prizes range from a two-night stay in a Grand Deluxe room with breakfast for two at The Peninsula New York (Cathay Pacific will also offer a special discounted rate for Business Class tickets to New York), Business Class round trip tickets to Hong Kong from Cathay Pacific, and a two-night stay in a Premier Suite with daily buffet breakfast for two and lunch or dinner buffet for two at Escolta at the The Peninsula Manila. 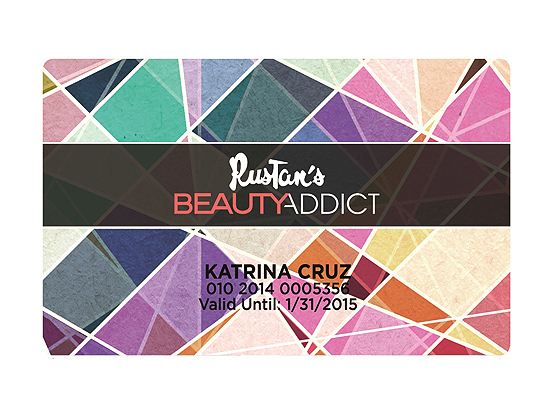 The Beauty Addict card is valid at all Rustan’s department stores until January 31, 2015. 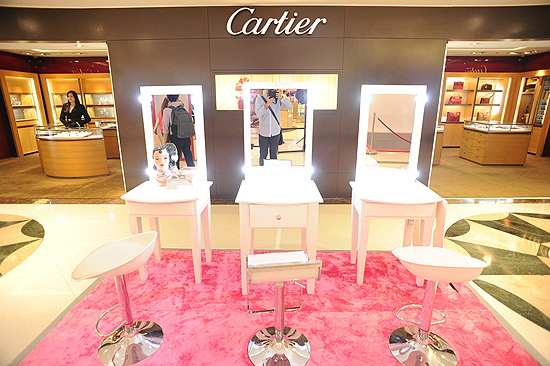 The card can be purchased for PHP299, or availed for free with a purchase of at least PHP2,500 from the cosmetics department.